This article is about the dish. For the cartoon short, see Ham and Eggs. Ham and eggs served with thinly-sliced ham and fried eggs prepared "sunny side up". Ham and eggs is a dish combining various preparations of its titular ingredients. It has been described as a staple of "an old-fashioned American breakfast" and of the traditional English breakfast. 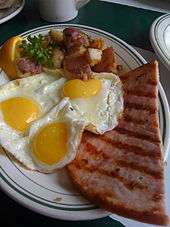 Ham and eggs is a popular dish often served as a breakfast meal in the United States. It is also consumed as a dinner or supper dish, for example in parts of the Southern United States, and is sometimes served as a lunch dish. Ham and eggs are the primary ingredients. Eggs served with the dish can be fried, scrambled or poached. Additional ingredients such as tomatoes and seasonings, such as Herbes de Provence, are sometimes used. The dish can be prepared on a stovetop in a skillet or frying pan, and also baked or broiled in an oven. The pan juices or gravy from the ham is sometimes drizzled atop the eggs to add flavor. The dish's quality can be enhanced by using high-quality ham and cooking the ingredients over low heat, which prevents overcooking. A recipe for country-style ham and eggs includes reducing cream in the pan after the ham and eggs have been cooked, and then dolloping it atop the dish. Ham and eggs can be accompanied with side dishes such as toast and hash browns, among others. Duncan Hines, an American entrepreneur, often enjoyed ham and eggs for supper. He said that people should choose ham and eggs as a meal at a diner when uncertain about what to order, because cooks cannot "disguise a bad egg nor spoil a slice of good ham. "[lower-alpha 1] According to his own account, on one occasion in 1899, Hines ordered five dollars' worth of ham and eggs at Harry Hynd's Restaurant in Cheyenne, Wyoming, a very large amount of food (according to U.S. government statistics, $5 in 1899 was the equivalent of $143.60 in 2015 dollars). Hines had had hardly anything to eat for four days, having had to walk about 16 miles (26 km) to Cheyenne after his horse gave out. About two miles into his hike, he had been given a few scraps of food by a hermit, after which he continued to Cheyenne, with five inches of snow on the ground. 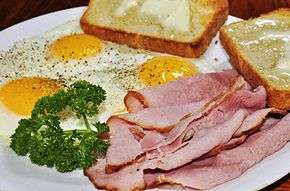 The counter person initially refused the order, saying that it would be impossible to finish it, but Hines was eventually provided with a large platter of ham and eggs and ate it all. Years later he wrote that nothing else had tasted as good as that platter of ham and eggs at that time. When Henry Puyi became Kang Teh, Emperor of the Manchurian Empire, a 1934 Associated Press story noted his taste for ham and eggs and other Western-style dishes. Ham and eggs and variations of it have had various slang meanings. In rhyming slang it refers to legs; the phrase was also used with this meaning in the US in the 1920s. "Like ham and eggs" refers to things that typically go together and are difficult to separate. To "ham and egg it" is to plug away at something. "Ham and eggs" or "ham and egger" can also refer to an ordinary, unskilled or mediocre person. A specific example of this is a boxer "with a minimum of talent"; "ham and egger" occurs in this context in the original Rocky film, filmed in 1975, when Rocky downplays his chances as a title contender, referring to himself as "really a ham-and-egger". Similarly, "ham and egger" / "ham and egging" are both used in rhyming slang to describe a "beggar", and the act of "begging", respectively. Participants in the Harriman Alaska Expedition of 1899 sometimes referred to the expedition as "the H.A.E." or "Ham and Eggs". Some participants in the expedition later participated in the "Ham and Eggs Club", a group of expedition members in the United States who reunited periodically. The group was formed when Louis Agassiz Fuertes declared in a letter that the H.A.E. had "resolved itself into the Ham and Eggs Club". John Muir hosted meetings in California, and John Burroughs often hosted meetings on the East Coast. The Ham and Eggs Movement was a grassroots movement and organization in California that placed a billion-dollar pension plan on the state ballot in 1938 as a proposed state constitutional amendment, named Proposition 25. Under the proposal, the state would have issued scrip payments to unemployed residents over the age of 50. After 1,103,000 California residents signed a petition, the proposal was voted on a second time in a special election in 1939, but despite what the New York Times called a "huge off-year vote", it was defeated two-to-one. For over forty years, the Lancaster Men’s Chorus on the Ohio University Lancaster campus has performed an annual concert called the "Ham & Eggs Show". ↑ This quote is from the book Duncan Hines: The Man Behind the Cake Mix, but it is not a verbatim quote from Hines. 1 2 3 4 Palmatier, R.A. (2000). Food: A Dictionary of Literal and Nonliteral Terms. ABC-Clio ebook. Greenwood Press. p. 168. ISBN 978-0-313-31436-0. Retrieved June 30, 2016. 1 2 Duda, C. (2008). Completely Breakfast. Cedar Fort, Incorporated. p. 78. ISBN 978-1-59955-102-9. Retrieved June 30, 2016. ↑ The American Magazine. Colver Publishing House. 1921. p. 132. Retrieved June 30, 2016. ↑ Fowler, Damon Lee (February 23, 2016). "On Food: Ham and eggs a comforting, versatile meal". Savannah Morning News. Retrieved June 30, 2016. 1 2 3 4 5 6 7 8 9 Hatchett, L. (2001). Duncan Hines: The Man Behind the Cake Mix. Mercer University Press. pp. 23–25. ISBN 978-0-86554-773-5. Retrieved June 30, 2016. 1 2 3 Williams, A. (2001). Beginner's Grub. Summersdale Publishers Limited. p. 129. ISBN 978-1-84839-966-2. Retrieved June 30, 2016. ↑ Gillette, F.L. ; Ziemann, H. (1890). The White House Cook Book. T.S. Menough. p. 132. Retrieved June 30, 2016. ↑ "Ham and eggs favorite dish of average man, Tribune says". Institute of American meat packers. 1920. p. 2. 1 2 Hollywood, P. (2014). Paul Hollywood's Bread. Bloomsbury Publishing. p. 168. ISBN 978-1-4088-4122-8. Retrieved June 30, 2016. ↑ Lincoln, M.J. (2008). Mrs. Lincoln's Boston Cook Book: What to Do and What Not to Do in Cooking. Cooking in America. Applewood Books. p. 200. ISBN 978-1-4290-9010-0. Retrieved June 30, 2016. ↑ Short (pseud.) (1880). Breakfasts and luncheons at home. p. 11. Retrieved June 30, 2016. ↑ Ronald, M. (2008). The Century Cook Book. Cooking in America Series. Applewood Books. p. 178. ISBN 978-1-4290-1206-5. Retrieved June 30, 2016. 1 2 Beard, J. (2009). James Beard's American Cookery. Little, Brown. p. pt1106. ISBN 978-0-316-06981-6. Retrieved June 30, 2016. ↑ Raines, K. (2016). On Toast: Tartines, Crostini, and Open-Faced Sandwiches. Quarry Books. p. 38. ISBN 978-1-63159-077-1. Retrieved June 30, 2016. ↑ "The Inflation Calculator". Retrieved July 10, 2016. 1 2 3 Green, J. (2005). Cassell's Dictionary of Slang. Weidenfeld & Nicholson. p. 671. ISBN 978-0-304-36636-1. Retrieved June 30, 2016. ↑ Partridge, Eric (2006) . Beale, Paul, ed. A Dictionary of Slang and Unconventional English (8th ed.). Routledge. p. 523. ISBN 0-415-06568-2. 1 2 Dolgopolov, Y. (2010). A Dictionary of Confusable Phrases: More Than 10,000 Idioms and Collocations. McFarland. p. 159. ISBN 978-0-7864-5855-4. Retrieved June 30, 2016. ↑ Pym, J. (2010). Time Out Film Guide. Time Out Film Guide. Time Out Guides Limited. p. 906. ISBN 978-1-84670-208-2. Retrieved June 30, 2016. 1 2 3 4 Litwin, T.S. (2005). The Harriman Alaska Expedition Retraced: A Century of Change, 1899-2001. Rutgers University Press. p. 193. ISBN 978-0-8135-3505-0. Retrieved June 30, 2016. ↑ Mitchell, D.J.B. (2000). Pensions Politics and the Elderly: Historic Social Movements and Their Lessons for Our Aging Society. M.E. Sharpe. pp. 24–48. ISBN 978-0-7656-0519-1. Retrieved June 30, 2016. 1 2 Goebel, T. (2003). A Government by the People: Direct Democracy in America, 1890-1940. University of North Carolina Press. p. 189. ISBN 978-0-8078-6018-2. Retrieved June 30, 2016. ↑ Loue, S.; Sajatovic, M. (2008). Encyclopedia of Aging and Public Health. Encyclopedia of Aging and Public Health. Springer. p. 406. ISBN 978-0-387-33753-1. Retrieved June 30, 2016. ↑ Braitman, J.R.; Uelmen, G.F. (2012). Justice Stanley Mosk: A Life at the Center of California Politics and Justice. McFarland, Incorporated. p. 28. ISBN 978-0-7864-6841-6. Retrieved June 30, 2016. 1 2 McWilliams, C. (1946). Southern California: an Island on the Land. Peregrine Smith Books. Peregrine Smith. p. 307. ISBN 978-0-87905-007-8. Retrieved June 30, 2016. ↑ "Ham and Eggs program set by Lancaster Men's Chorus". Perry County Tribune. April 2, 2013. Retrieved July 1, 2016. ↑ "Lancaster Men's Chorus Donates to Wagner Theatre Improvement Campaign". Ohio University. April 8, 2015. Retrieved June 30, 2016. Underhill, J.E. (1910). Sunshine Cook Book: A Collection of Valuable Recipes and Menus Gathered from Various Sources. J. E. Underhill. p. 73.